The CMV ImmunoStrip® is an on-site tool to quickly identify CMV-infected plant with or without external disease symptoms. This test detects all known CMV isolates including all isolates belonging to subgroup I and subgroup II. This test does not require any special equipment or expertise to run. 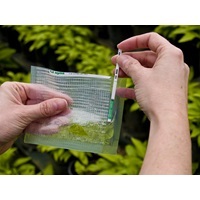 Results are obtained in as little as a few minutes making it ideal for scouting regimes or to test plants before purchasing or accepting a shipment of plants.